JP's Music Blog: DVD Review: The Scorpions Look Back On Their Career With "Forever And A Day"
DVD Review: The Scorpions Look Back On Their Career With "Forever And A Day"
The premier German heavy metal band, The Scorpions celebrated their 50th anniversary this year with a new album "Return To Forever," deluxe editions of their first eight albums along with a full-length documentary titled "Forever And A Day." The DVD was released on November 27th through MVD Entertainment Group and shows clips of the band performing live during their highly successful 2011-2012 tour. The history of the band is explained by its members, mainly in German with English subtitles along with others involved in their history. It also shows classic cuts from the band, including their first television appearance and rare video of them in the studio. They explain that their music is surrounded by the amazing guitarists that have been in the band. The band members describe how when The Scorpions went into Russia in 1988 and gave their fans the concert of their lifetime as one of the first Western groups to do so. The talk about that feeling they were walking a thin line of what could have been an explosive situation. Some of the great moments of this film are when each member of the band are on their own, reflecting on the past and also their current situation as a member of one of the biggest heavy metal bands in the world. The wonderful thing is how well all the of band members get along with one another, even the ones that have not been in the band since their beginning. Highlights of the film are when The Scorpions are working live with a full orchestra and their 2012 appearance at The Waken Open Air Festival, but their best act came in America during the US Festival 1983 where they became this worldwide unstoppable presence on the metal music scene. While The Scorpions have discussed numerous times about the possibility of retirement, thank god that didn't happen and the band is going stronger than ever. They are currently wrapping up a tour of Europe and are looking to hit the road again in February and March of 2016. There is no stopping The Scorpions as their live shows have become the highlight of the year for many venues. 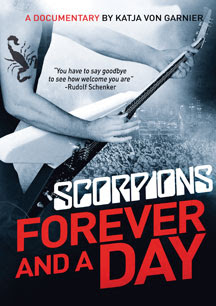 To find out more about this new documentary, "The Scorpions Forever And A Day," please visit the-scorpions.com/foreverandaday.